The idea of a rainbow if you’ve never seen it before, isn’t as beautiful as once you see it. The image of more than 7 colours in one space screams chaos more than beauty. That’s the same thing that happens when one tells people about IkamvaYouth; we are an organisation that brings together learners of different schools and grades and offer them academic and social assistance, above all else. We also provide a space for these learners to be able to assist each other as much as possible. We live in a society that is inevitably divided by class, which in most cases motivates how we interact and treat one another. Same applies with the learners we work with. As much as they may share same geographical spaces, but some of their defining backgrounds differ which subconsciously interpret their approach. It is only normal for one to expect to see a lot of diversity and ‘clicks’ formed based on the type of schools our learners come from. 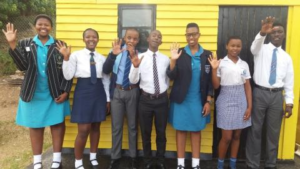 Teenagers tend to feel more comfortable when they are within their norms, but what one witnesses once they enter an IkamvaYouth session is like seeing the rainbow for the first time after a stormy day. I once had a conversation with a colleague of mine from the branch, we were talking about how beautiful it is to see learners that we know societally would have never even exchanged hellos or came across each other’s paths and yet there they are inside our branch assisting one another and forming friendships. It is such a great image to see our learners breaking whatever walls and boundaries put by society and seeing each other as brothers and sisters before everything else. As new learners are pouring in at our different branches, I can’t help but smile and feel the utmost joy knowing that they are about to meet some of the most incredible young people of their age, who are only defined by the brighter future and being each other’s keepers (Peer to peer support).